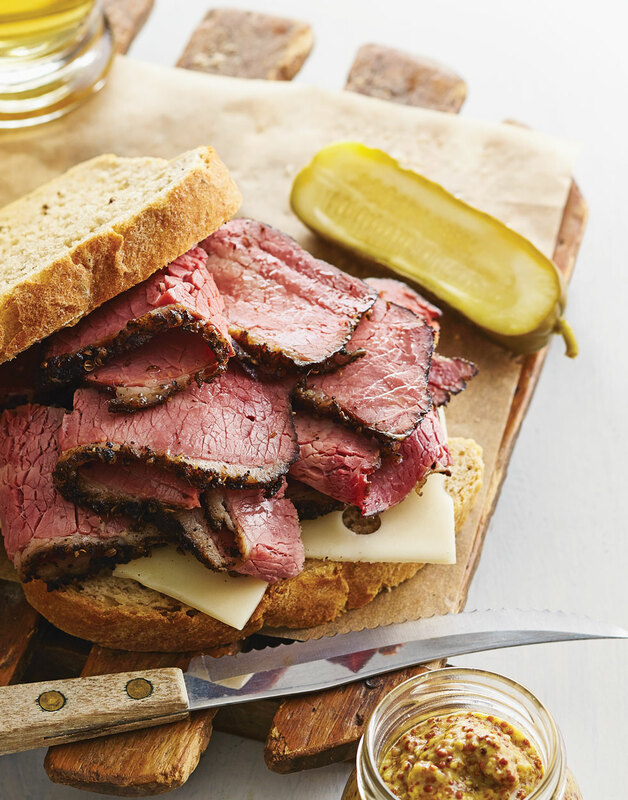 Making pastrami isn't a weeknight project, but once you try your hand at making this highly coveted deli staple, you'll fall head over heels for its succulent slices. So with this recipe at the ready, check out our step-by-step tutorial How to Make Homemade Pastrami and you'll be carving juicy slices of the deli delight before you know it. If the brine isn’t below 40 degrees after adding the ice and water, chill it until it is. For food safety measures, never add meat to a warm brine. For the brine, heat 8 cups water, kosher salt, brown sugar, pink salt, bay leaves, cinnamon sticks, garlic, ginger, mustard seeds, coriander, peppercorns, allspice, and cloves in a large nonreactive pot over high until brine comes to a simmer, stirring to dissolve salts and sugar, 12 minutes; transfer to a nonreactive container. Stir ice plus water into brine. Once brine is cold, place brisket in brine, weigh down to keep it submerged, then refrigerate 24–26 hours, turning occasionally. Remove brisket from brine, pat dry, hen place on a rack set in a baking sheet and refrigerate, uncovered, 8–12 hours. Discard brine. For the rub, grind coriander and peppercorns in a spice grinder until the texture of chunky sand. Coat brisket with rub, then set on a rack in a 12×16-inch disposable foil pan. To smoke, preheat grill (and the built-in smoker box, if you have one) to high. Place 5 wood chunks on grill grate over far right heating element (or smoker box). Once chunks are really smoking, reduce heat to medium-low on far right heating element (or smoker box) and shut off all other heating elements to maintain a temperature of about 225°. Place prepared brisket pan on unlit side of grill. Fill pan with 1 inch of water. Smoke brisket, covered, until an thermometer inserted into the thickest part registers 150°, about 6 hours, rotating pan halfway through, and replenishing spent wood chunks as necessary. Remove brisket pan from grill and let it and the liquid come to room temperature. Transfer liquid to a microwave-safe container, then cover. Tightly wrap brisket on rack and pan. Refrigerate brisket and liquid overnight. To steam, preheat oven to 250°. Microwave liquid until hot, then pour into bottom of pan. Cover brisket with parchment paper, then tightly wrap with heavy-duty foil. Steam pastrami until an instant-read thermometer inserted into the thickest part registers 202°, 4–6 hours. Let pastrami rest 15 minutes before thinly slicing against the grain. Adding pink (curing) salt to the brine gives the meat its characteristic flavor and color, plus it prevents spoilage. Different brands of salt can vary in cup for cup measurements because of the size of the grains, so be sure to weigh both of the salts for accurate ratios. Choose untreated wood chunks to smoke with — they’ll last longer than chips. And if a smoker is available to you, feel free to use it, rather than your gas grill. Since the fat makes it harder for the brine to thoroughly penetrate the meat, trim it to within &frac18;–¼-inch. Don’t trim off all the fat, though. It keeps the meat moist. Smoking makes it hard to see the grain of the meat. Cut off a small piece, perpendicular to the grain, before brining so you have a sense of where the grain is after smoking. For the correct amount of water in the brine, measure out 8 cups ice first, then fill the measuring cup with water to the 8-cup mark. The simplest way to ensure the brisket is fully submerged in the brine is to weigh it down with a sealed plastic bag full of water. So they don’t fizzle out before they get going, be sure the wood chunks are really smoking before reducing the heat under them, shutting off the other burners, and placing the brisket on the grill. To prevent heat levels from rising inside the grill, pour water into the pan under the brisket. If temps rise, check the wood chunks. If they’re flaming, rather than smoking, liberally spritz them with water. This produces more smoke and drops the temperature. So the connective tissues in the pastrami break down, tightly wrap it with foil to trap steam inside the pan. But, first cover the pastrami with a layer of parchment paper. This is to protect it from a chemical reaction known as “lasagna cell” that can melt the foil. Get Your Taste of Deliciousness! Subscribe Today and Receive a Free Bonus Book! Looking for a little more inspiration or ideas? With appetizer, snack, breakfast, brunch, lunch, dinner, side dish, drink, and dessert recipes, from grilling and barbecue to slow cooked, make ahead, and everything in between, we aim to help you in your cooking endeavors with straightforward and flavorful recipes. © Cruz Bay Publishing, Inc. an Active Interest Media company. All Rights Reserved. What is more comforting on a chilly, snowy day than enjoying a warm cup of soup? These recipes are bound to make winter a lot easier to tolerate and way more delicious. 5 Sensational Soups & Sides Today! What is more comforting on a chilly, snowy day than enjoying a warm cup of soup? These recipes are bound to make winter a lot easier to tolerate and way more delicious.